Remote work teams are becoming more and more prevalent in the work force (one stat estimates that telecommuting has risen 79 percent between 2005 and 2012). But if your team has folks working all around the country–or even the world!–how can you make sure you’re communicating effectively and maintaining a happy and healthy organizational culture? 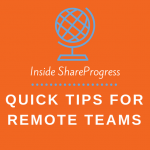 Over here at ShareProgress, we’re still figuring things out, but we do have some experience working collaboratively as a (partially) remote team. We’ve established a few tricks for making remote working easier AND more fun. Read a few of them and let us know if they match what your organization is doing, or if you have tricks of your own to add to the list. Find an easy way to communicate. We use Slack (which also got a shoutout in last week’s post about web apps! ), which is a super intuitive group chatting platform (think Gchat on steroids). It lets you set up smaller group chats within the larger group chat, send over files, search through archives, and integrates easily with other apps. It gives us a quick way to chat with each other and send over what we’re working on throughout the day. We even have a channel for all the weird things we find on the web throughout the work day. Put someone in charge. For us, it’s Cindy, our wonderful Web Developer. She coordinates our team bonding activities and makes sure that we actually do the fun stuff we’ve committed to doing! Do some fun stuff! We’ve committed a couple of different ways to come together and bond as an organization. One of them is sharing a fun fact about ourselves once a week during a daily check-in. These have ranged from talking about our favorite books to sharing photos of the places we’d like to travel to next. And don’t be afraid to get creative. We also committed to doing a team bonding activity of some kind every month. Since we’re not all in the same state, that’s required some outside-of-the-box thinking. 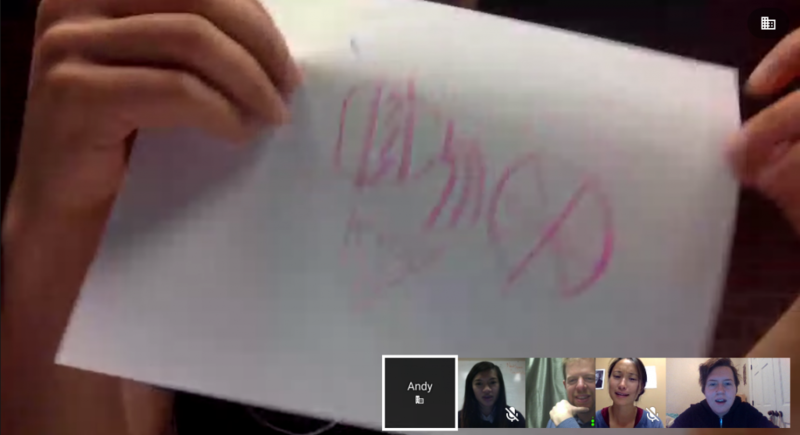 So far we’ve played RoboRally against each other online and played Pictionary via Google Hangout–you can see a screenshot of that below. Plan time to come together in real life. If it’s feasible for your organization, nothing beats spending time face to face. We’re committed to meeting up as a team once every quarter, but a different frequency might work better for your organization. That’s how we’re making remote working work for ShareProgress. Was there anything we missed? Any ideas for what we should do for our next monthly virtual hangout? Let us know in the comments!